What do you value? How do these important themes appear in your life? When you stay true to yourself and your values, they will show up everywhere! The PNW Marathon team discusses this during their week 7 on the 8 week countdown to Race Day! Read on to hear more! This week I’ve upped my training again, spending more time on my feet. My goal is to run faster than I’ve ever run, so finding my happy pace is not just time in shoes but also faster workouts. 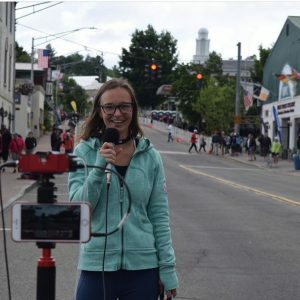 I did my long run on Saturday and covered the lake placid marathon route. which is undulating, hot and beautiful. There were a ton of people out on bikes and I got to run with my Co-host Sara who happens to also be my ironman coach and she paced me and then outkicked me at the end (darn!) It was important to me on this trip that we keep up our fitness and keep a schedule… it’s so easy to just get tired and eat junk for quick energy. So, all week we ran together, some exploratory runs, a tempo, a long run and then a shake out. Running while you are in new places is challenging because you don’t know the routes necessarily. I use strava to kind of map out where we are going and then always run with either a credit card or some cash so I can buy water along the way if I can’t find a fountain – especially on a long day. My long run was 1:50mins which worked out to be 20kms, I felt slower than I wanted to be but I have to remind myself that the long runs shouldn’t be race pace. Training for this marathon in the past weeks has reminded me how important it is to have friends who share your values, who don’t mind jumping in for a run at your pace or just showing up to be on the same start line. That extra encouragement is priceless. Lately, I have been focused on cultivating a better mind/body connection. I’ve been using hiking, circuit training, yoga, reading and journaling as ways to explore this topic. Through exploration of mind/body connection, I feel that the mental and physical health I value are being paid proper attention. As I begin to hit the trails and build the KMs towards the half marathon, I’m channeling this connection into my running. This shows up in how I am listening to my body, and taking time to recover, relax and reflect. Curiosity and adventure are what inspired me to sign up for the half marathon, and these values are what have been motivating me throughout the summer as I say “Yes!” to new opportunities, meet new friends, try new foods, and explore new trails. This week I have definitely logged many more kilometres than in weeks past. My feet are “sore” but slowly waking up to longer distances! Legs are feeling stronger too. This past weekend, I spent 2 days in Garibaldi park climbing to Panorama Ridge. 18km of which was with a 70L bag on my back. 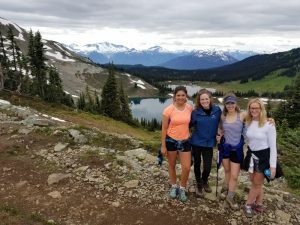 My hiking boots took me to marathon distances through all sorts of obstacles – and swarms of hungry mosquitoes! I value this time spent in nature and love exerting myself to reach new heights and new possibilities for myself! I had a moment at the second highest landing where I felt like I had done enough. I was so over it. But everyone else pushed me to do the whole thing. I’m thankful for friends that remind you of what’s important. Never settling for less than the summit! It was my last week in Rajasthan, India and my favourite part about this social justice practicum has been the connections that I have made. I value connection and I really appreciated the experience I had living with a host family in Udaipur. I really connected with the eldest daughter. She had never been to a gym before and when I asked her to come with me for her first time she had a huge smile on her face and was up for the experience. I will never forget the feeling I had seeing her trying something new and having her look back at me to see if she was doing it right.  I am so excited that I get to run the Oregon half marathon with Sole Girls. These amazing women I am running with are not only my peers but some of my best friends. I met them through Sole Girls and we all connected immediately as we value trust, connection, health and fun to name a few. Here is to finding people who align with your values and living your best life!! So…….. I have never done a marathon before. I have only run a few 5 km races with my daughters. And I tend not to run outdoors much because I never really enjoyed the inconsistency of speeding up, slowing down, taking breaks, etc…. without a machine telling me I was doing so, or it telling me that I had only 30 more seconds to complete my ‘Pause’ mode. But how I do love the rush after a death-defying hike!! And think hiking in the depths in the forest in the winter, and the wee hours of the am in summer (did all 3 peaks of THE CHIEF in one day) has upped my cardio vascular stamina. I just returned from a 3 week trip with my girls from Europe. And my first goal upon entering each new Country was kind of bizarre for my girls, but they eventually learned to accept the fact that if they needed mommy to be mentally and emotionally and spiritually well, she needed some sort of outlet. So I enrolled in the closest gym to our place before even checking into the hotel. Now I know that running on a treadmill or an elliptical is nowhere close to that of thee ‘Great Outdoors’, but when you are across the world, there is no room for ‘pickiness’. I so value so many things, but first and foremost, I value my health, my mindset, my upbringing from my father, to instill the love for physical activity in my life. He was a runner, a boxer, a wrestler, and a body builder. Back then, there was no daycare so when my mom worked nightshift, he would take me along to the gym (at 6 am after HIS nightshift). Needless to say my love for fun with activity (and lots of huffing and puffing at a young age) had just begun. And it continues. And the best thing it does as it shows my girls that if they put their minds to anything, they too will be able to lug suitcases and backpacks and excess cargo around the world with their loved ones too one day. So blessed I got the opportunity. And so blessed to have Sole-Girls. Both my daughters were once sole-girls, and are now developing into sole-woman. If that (and a marathon) is not one my biggest accomplishments and goals (and achievements), then nothing else ever will be. Looking forward to running at the marathon……. and so looking forward to continuing my race and watching my daughters’ races in life as well.